Pongal is a harvest festival that is celebrated by Indians all across the world, but especially in south India. The four day occasion is observed in the month of Thai, when crops such as rice are harvested and people show their gratitude to the almighty and the generosity of the land. The word Pongal means ‘overflow’ or ‘boiling over’ and also signifies the gradual heating of the Earth by the Sun. 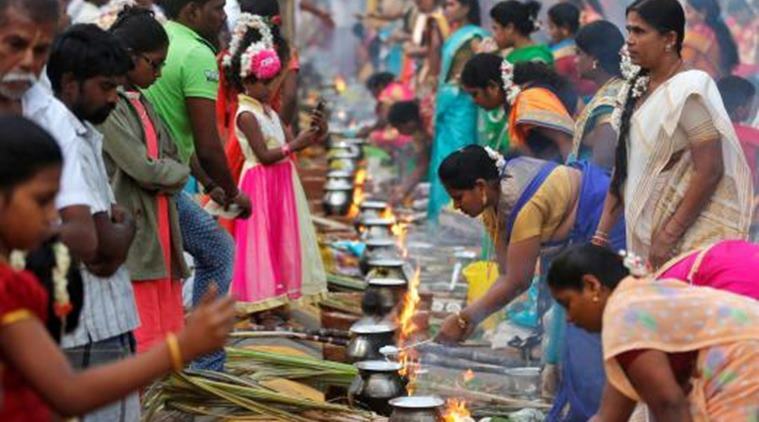 This festival, which is also known as Thai Pongal, starts on Every January. The festivities begin with people boiling the harvested rice and then making an offering to the Sun God as their way of showing regard and appreciation. Tamilians celebrate the occasion by making traditional designs known as kolams in their homes with rice powder. This powder is available in white as well as various other colours. The kolams are drawn to welcome goddess Lakshmi, who is believed to bring wealth, prosperity and happiness into the household. For the customary celebrations, various types of dishes using rice, jaggery and lentils are prepared. Being a holy month, many prefer to get married during the month of Pongal. The first day of the festival is dedicated to god Indra. A huge bonfire is lit and kept burning throughout the night. Offerings are prepared for the lord and ‘Bhogi Kottus’ or buffalo-skin drums are beaten as people revel in traditional folk songs and dances. Houses are decorated with kolams and cow-dung balls with yellow pumpkin flowers set on them. Day two is dedicated to the Sun god and a special harvest dish made of rice, jaggery, turmeric and lentils is made and brought to boil till it spills over in mud pots. This special dish, with sugarcane sticks is called Sakkarai pongal. Legend goes that Lord Sundareshwar breathed life into a stone elephant in the temple of Madurai on this day. The third day of the festival is to honour and show gratitude towards the cattle stock. Elaborate and colourful garlands and bells are tied around the necks of cows before performing the rituals. The popular cattle race jallikattu takes place on this day. On the fourth and the last day known as Kaanum, which means ‘to visit’, people come together and hold grand unions. Landlords offer money, gifts and clothes to their tenants and brothers convey their regards to their married sisters. The festival is celebrated together with near and dear ones and families spend quality time together. It is believed that deities woke up after a six-month sleep around this time and men who expired during this period achieved mukti or moksha. The festival marks the Uttarayana or the commencement of the sun’s six-month journey towards the north. As per another popular legend, it is believed that lord Shiva asked his bull Basava to go to Earth and tell the men of the land to take an oil bath everyday and have food once a month for six months. However, due to Basava’s carelessness the bull ended up mixing the two and conveyed a message that all should eat daily and take an oil bath every once a month. This infuriated the lord and he punished the bull by cursing him to assist humans in ploughing the fields. This is why cattle stock is worshipped and tamed in the popular sport Jallikattu. However, there is another story that states that lord Krishna asked the cowherds to not worship Indra god, in order to teach him a lesson. Indra’s arrogance had risen after he was made the king of all deities. In his anger, he made the clouds bring thunderstorms and rains for three days, but Krishna protected the people by lifting the Govardhan mountain. This made Indra god realise his mistake and Lord Krishna’s power.